Win 'Parks and Recreation' boxsets! Win ‘Parks and Recreation’ boxsets! Posted June 21, 2015 by William Martin & filed under Win. 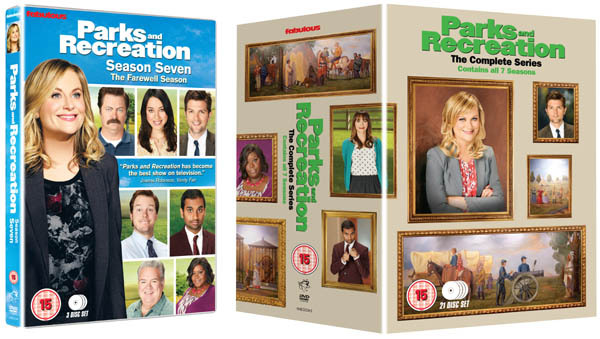 Parks and Recreation Season 7 and The Complete Series Box Set (including all 125 episodes on 7 discs loaded with bonus features) are available for the first time in the UK on DVD on Monday 29 June. To celebrate the release, we’ve got a complete boxset to give away to one of our Twitter followers and three Season 7 boxsets for runners-up! The show has a massive IMDB Rating of 8.6/10, and Season 7 has a 100% rating on Rotten Tomatoes. Set in 2017, this final season stars 2014 Golden Globe winner Amy Poehler as Leslie Knope Regional Director of The National Park Service, she takes on the rise of fictional tech company Gryzzl, who have designs on her beloved Pawnee. The whole series mirrors the rise of Hollywood Superstar Chris Pratt. He was originally scheduled to appear in only six episodes of the first season – but won over the producers and became a regular. He then won the lead in Guardians of the Galaxy, after shedding 60lbs. He is now the star of Jurassic World – the highest grossing debut of all time. This competition has now closed. The winners are Alice McQueen from Bournemouth, Pauline Dennis from Mansfield, Mark Small from West Bromwich and Aaron Carlin from Coventry. Terms & Conditions: Employees and contributors of CultBox.co.uk and their families are not eligible to enter. The judge’s decision is final and no correspondence will be entered into. The prize may not be transferred to any other person. No cash alternative or alternative prize is available on entrant’s request, but in the event of the advertised competition prize being unavailable we reserve the right to offer an alternative prize of equal or greater value. Entry in the competition implies acceptance of these rules. Win an epic bundle of complete series TV box sets! Win a bundle of classic TV boxsets! Win ‘Parks and Recreation’ Season 6 on DVD!